We provide gallery lessons for students preschool through 12th grade. Our staff will also work with you to design a museum lesson that is tailored to your needs. All lessons meet National, State and Common Core Standards. All lessons are approximately 45 minutes to an hour depending on age level. Lessons are designed to relate to classroom studies and include at least one stop in a changing exhibition gallery. Many of the programs below can be extended or designed to fit your curriculum needs. Content for each lesson is adjusted to fit the grade level of your group. 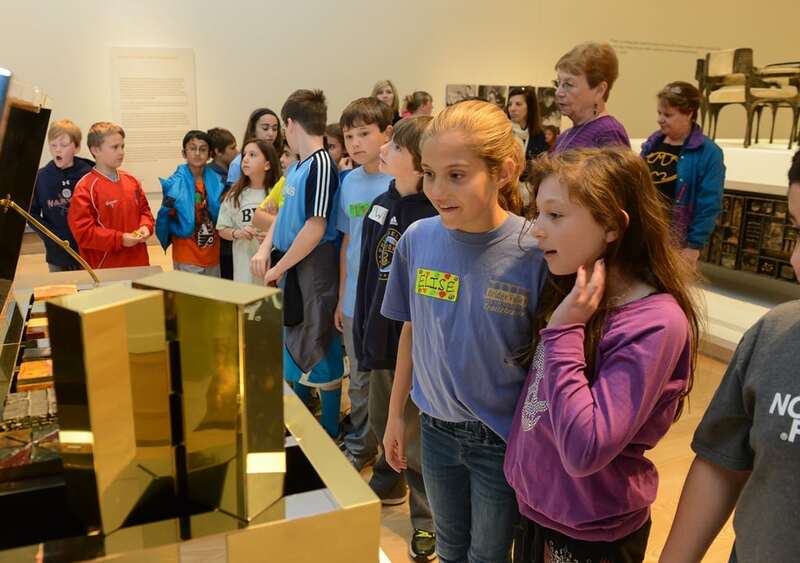 For longer, more in-depth programs combining a gallery lesson and a studio or language arts activity, please email msandquist@michenerartmuseum.org or call 215.340.9800 x124. The combined program includes an associated fee per student. For outreach programs at your school, visit our Outreach Programs Page. For large school groups, consider a dual tour with the Mercer Museum. Half the students can tour the Michener while the other half visits the Mercer. After one hour, the two groups switch places. Reservations and payment must be made separately with the Mercer Museum or 215.345.0210. 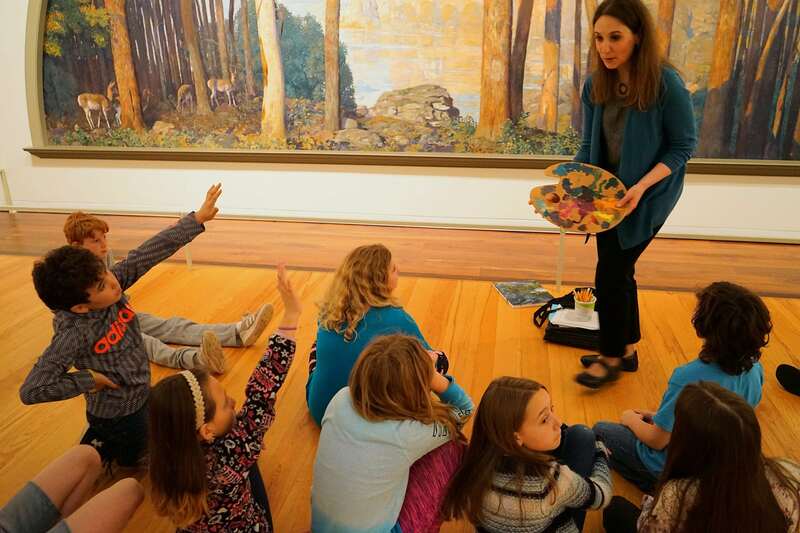 ArtStart In this hands-on interactive lesson, children learn art themes, art media and museum terms in this introductory lesson to the wonders of the museum. Tell Me a Story Story making and illustration can be the basis for making art and learning about art and artists. In this program, age-appropriate books and stories are incorporated into unique gallery lessons. Works are examined and discussed in terms of the illustrative properties of their images. Optional studio art lesson available. Art and Nature Learn about how art and science travel hand in hand at the Michener while studying great works of art. Weather, seasons, time of day, climate and the environmental issues of today are presented in lively museum lessons. Optional studio art lesson available. Look into Landscape Students will focus in depth on landscape painting by looking at the Michener’s permanent collection of Pennsylvania landscapes along with works by abstract and contemporary artists. Students will learn the variety of approaches and styles in a landscape painting. Optional studio art lesson available. Museum Mysteries Treasure hunts, imagination games and hands-on interactives make this lesson come alive. Students are “art detectives” as they discover different media, themes, vocabulary, and subject matter in art. Portrait Personalities Students will focus on the depiction of the figure in art by studying portraits in the Michener’s permanent collection. Students will study the face and the figure through paintings and sculptures in the galleries using discussion, role-playing and storytelling activities. Optional studio art lesson available. 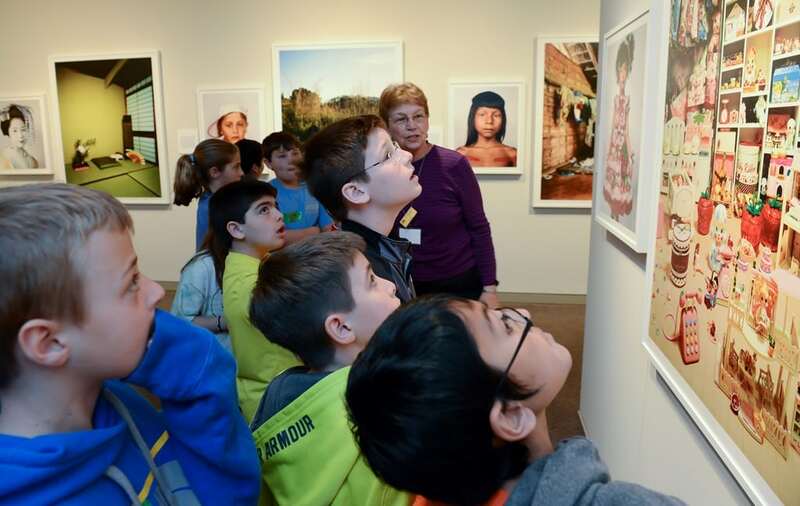 Art, Nature and Science Learn about how art and science travel hand in hand at the Michener Art Museum while studying great works of art. Weather, seasons, time of day, climate and the environmental issues of today are presented in lively museum lessons. Discussions may also include color theory, light, and influences with technology. Optional studio art lesson available. 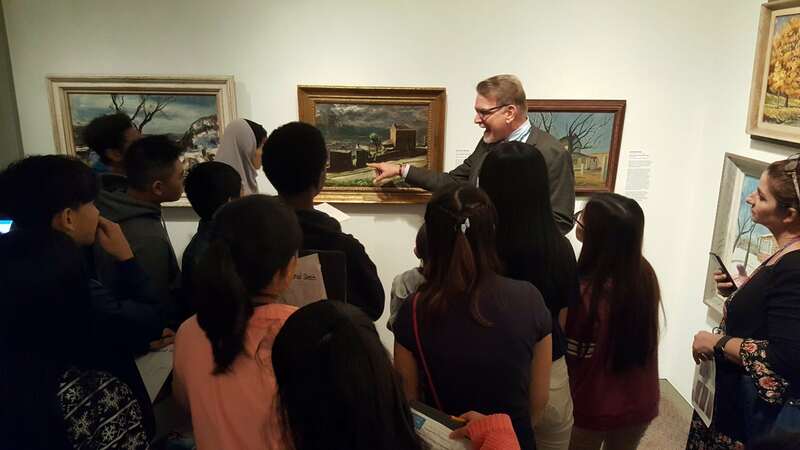 A Lasting Impression Students will explore topics related to the Pennsylvania Impressionists, Pennsylvania history, geography and Bucks County heritage. Works such as The Portrait of Edward Hicks, and Daniel Garber’s mural, A Wooded Watershed, are just some of the highlights in this interdisciplinary lesson. Basically Biographies From the presidents and statesmen depicted in our paintings to the artists who created the works in the galleries and sculpture gardens, there is much to learn to about the biographies of famous artists and historical figures at the Michener. Join us at the museum to study the important details of the lives of people represented by our extensive collections. Optional studio art lesson available. From Realism to Abstraction Students will gain an understanding of the evolution of modern and contemporary art from the realistic images created in early American art. Students will learn about the influence of technology on a variety of art forms. Students will engage in a lively discussion to answer the age-old question, “What makes it art?” Optional studio art lesson available. Exploring the Three-Dimensional Art Form Students will focus on the various kinds of three-dimensional works found inside and outside the museum. Students will learn about the various methods and materials used by sculptors, craftsmen, and furniture designers. Students will discuss the sculpture found in the permanent collection, the Arts and Crafts designs of regional artists, and the installation of the Nakashima Reading Room. Word and Image Students will learn the different tools writers and artists use to make an engaging work, along with learning about parallels that occur in each art form. Activities include in-depth observation, discussion and analysis of works of art in the galleries. Activities in poetry, creative writing, and storytelling are explored in response to the works. From Realism to Abstraction Students will gain an understanding of the evolution of modern and contemporary art from the realistic images created in early American art. Students will learn about the influence of technology on a variety of art forms to answer the age-old question, “What makes it art?” Optional studio art lesson available. Looking Beyond Bucks County’s Art Art criticism, art history and aesthetics are explored while students take a more advanced approach to the art of looking at Bucks County’s art and artists and placing it in context to art movements in history. Students will use critical thinking skills to compare and contrast works of art, while utilizing skills in deductive and inductive reasoning, and making inferences and conclusions. Exploring the Three-Dimensional Art Form Students will focus on the various kinds of three-dimensional works found inside and outside the museum. Students will learn about the various methods and materials used by sculptors, craftsmen, and furniture designers. Students will discuss the sculpture found in the permanent collection, the Arts and Crafts designs of regional artists, and the installation of the Nakashima Reading Room. Changing exhibition works will be included if available. Word and Image Students will learn the different tools writers and artists use to make an engaging work, along with learning about parallels that occur in each art form while looking at different works of art in the galleries. Activities include in-depth observation, discussion and analysis of works of art. Activities in poetry, creative writing, and storytelling are explored. Sketching in the Galleries Students will explore the various sketching techniques that artists use in creating their work. Through discussion and in-depth observation, students will have the opportunity to spend time in areas of the galleries to sketch on their own. Journaling may be incorporated into this lesson if requested. Optional studio art lesson available. 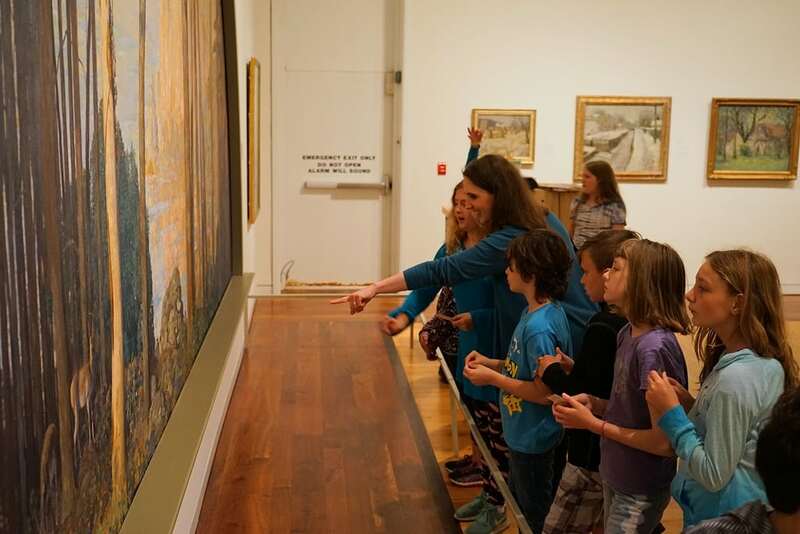 Focus Tours/Special Exhibition Lessons (all grades) Teachers may plan a lesson for any grade level with a focus on one specific work of art, gallery, special exhibition or theme and its connection to the entire Michener collection. Optional studio art lesson available. Self-Guided Visits (7-12) Teachers may visit the museum with student groups on their own, without museum education staff. Requires reservation.